and a delicious green tomato mincemeat recipe. I was born and raised in England so Christmas just wouldn’t be complete without mince pies, always offered to visitors during the holidays, and present on the Christmas dinner table even when all of us are too stuffed to eat another morsel. No matter – a few hours after dinner is digested, you can be sure all of those savory spiced mincemeat pies disappear like magic! I’ve often wondered about the origin of the name, “mincemeat” which these days usually has no meat content, except perhaps beef suet, which is more often substituted by lard, vegetable shortening or oil. A little research on the net explained the mystery. This green tomato mincemeat recipe was adapted from The Home Preserving Handbook produced by Canadian Living Magazine, one of the magazines that I have contributed to extensively as a freelance writer. I first used it about five years ago, and was very pleased when it passed muster with both my mother and my mother-in-law – both of whom are English ladies who have cooked mince pies for decades. Combine all ingredients, except brandy, in a large saucepan. Bring to a boil, over medium heat, then reduce heat and simmer, stirring frequently, for two hours. 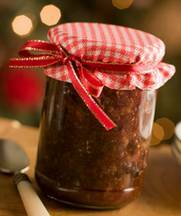 Remove from heat, stir in brandy, if using, then ladle mincemeat into hot, steralized canning jars and seal with two-part canning lids, according to manufacturer’s instructions for sealing. Process in a boiling water canner for 10 to 15 minutes. Store in a cool, dry place. Makes about 7 cups. Folklore states that mince pies are a favourite food of Father Christmas, and that one or two should be left on a plate at the foot of the chimney as a thank-you for stockings well-filled. English tradition demands that the mince meat mixture only be stirred in a clockwise direction. To stir it anticlockwise is to bring bad luck for the coming year. Tradition also says one should make a wish whilst eating one’s first mince pie of the festive season, and that mince pies should always be eaten in silence. Eating at least one mince pie on each of the twelve days of Christmas is said to bring luck for the coming year. Mince pies should traditionally have a star on top, to represent the Christmas Star which led the shepherds and Magi to the baby Jesus in Bethlehem.